The research found that those postmenopausal women who drank green tea daily had 20% less urinary estrone and 40% less urinary estradiol levels, when compared to those levels of women who drank green tea less than one time per week. These estrogen levels followed their categorization with regard to the estrogen metabolism pathway involved. This allowed the researchers to determine that these urinary estrogen differences were related to their estrogen metabolism and their future risk of breast cancer. The primary estrogen pathway connected with breast cancer is the 16-hydroxylated estrogens. As for the 16-hydroxylated estrogen pathway, both estradiol and estrone markers were 40% lower among those women who drank green tea at least one time daily compared to those women who drank less than one cup of green tea a week. Levels of caffeine consumption did not change these dynamics among the women. And black tea consumption did not produce these decreases in estrogen metabolites. Furthermore, estrogen levels of premenopausal women did not respond to green tea consumption. This did not surprise the researchers, as previous research has found that postmenopausal women respond differently to medications such as tamoxifen and aromatase inhibitors. Interestingly, the research also found that the average urinary estrogen levels of the entire postmenopausal Japanese-American group was about half of the levels that were found in a recent study of postmenopausal women from New York who were primarily Caucasian. The researchers could not determine the reason for the difference – stating that it could be related to differences in diet, lifestyle factors or others. While other studies have shown some differences in urinary estrogen levels and green tea drinking among women, this is the first study that analyzed a broad range of estrogen metabolites among peri- and postmenopausal women. Postmenopause follows one year after the stage of menopause, when a woman’s ovaries halt egg production. During this period, estrogen and progesterone production is reduced. During this period a woman may experience symptoms related to lower levels of estrogen production. These include hot flashes, night sweating, insomnia, headaches, mood swings and other physical symptoms. Many doctors recommend halting caffeine consumption during postmenopause, to help with menopause symptoms. This may run some conflict to green tea consumption, as a cup of green tea will typically contain about 20 milligrams of caffeine – as compared to about 30 milligrams in black tea and many sodas, and about 80 milligrams in a cup of coffee. However, there are forms of green tea that contain less and even no caffeine. Gyokuro and Sencha Green teas will contain about half the caffeine content. The Joujicha green tea, the Genmaicha tea (mix of Bancha and Genmai – rice grain), and the Bancha green tea can contain up to ten times less caffeine than standard green teas. In addition, there are now several decaffeinated green tea products available. The “Effervescence” decaffeination process, which uses water and carbon dioxide will retain over 90% of the green tea’s polyphenols. The other method, wherein ethyl acetate is used as a solvent, can lose as much as 70% of the green tea’s polyphenols during decaffeination. And of course, black tea has the most caffeine, and does not provide the same medicinal benefits. Even though black tea is made from the same plant – Camellia sinensis – black teas are dried and oxidized under intense heat and/or sun, during which they lose much of their medicinal constituents. Another 2013 study from Italy’s University of Calabria found that epigallocatechin gallate specifically down-regulates a gene that stimulates cancer growth. Other foods containing catechins, such as olives, blackberries, raspberries, cherries, grapes, apples, papayas, mangoes among many others, also have shown anti-cancer effects. Many herbal teas also contain catechins. 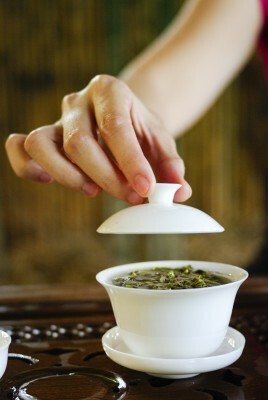 For additional research on Green Tea’s health benefits visit: Green Tea benefits. Tagged breast cancer, green tea. Bookmark the permalink.